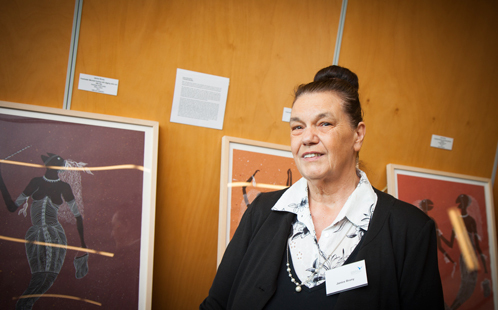 This artwork was painted for the University of Western Sydney by Mrs Janice Bruny in support of the Aboriginal and Torres Strait Islander Education initiatives. It provides an Aboriginal perspective of education at the University of Western Sydney and it is about the university, what they do and where they are situated. These large ancient trees were highly regarded and met many needs of our people. Beneath the large branches was the traditional place for learning and knowledge sharing. They were a source of food, fruit, nuts, seeds, clothing, shade, shelter, building materials and even some natural medicines. 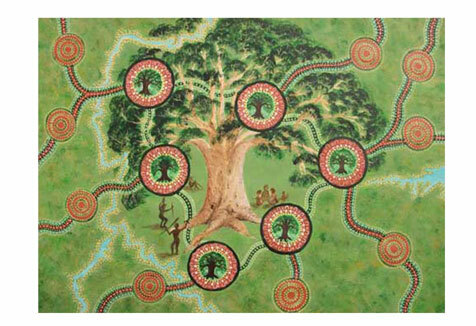 In the centre of the painting is the Tree of Knowledge which is at the centre of Aboriginal Education. Set under the cool branches, learning takes place, the telling of stories, learning song and dance. This is where we learn about our culture, country, lore and people as well as make artefacts and or decorate personal items. This is why it is the Tree of Knowledge. Each of the small circles with trees represents the six University of Western Sydney campuses, Parramatta, Bankstown, Campbelltown, Penrith, Hawkesbury and Nirimba. The trees are surrounded by yellow with green dots and represents people associated with learning. Yellow ochre and white along with green dots then red ochre represent the buildings and places of learning. The U shape is a traditional representation of a person and is utilised in the painting to represent students. The square shape between students represents books, computers and electronic learning tools.